Ever wondered how fast the fastest computer on Earth is? Well wonder no more because the latest edition of the Top 500 supercomputers was published earlier this week. Thanks to this list we can see that the fastest (publicly announced) computer in the world is currently an American system called Jaguar. Jaguar currently consists of 37,376 six-core AMD Istanbul processors and has a speed of 1.75 petaflops as measured by the Linpack benchmarks. According to the BBC, a computation that takes Jaguar a day would keep a standard desktop PC busy for 100 years. Whichever way you look at it, Jaguar is a seriously quick piece of kit. All this got me thinking….how fast is my mobile phone compared to these computational behemoths? People have been using the Linpack benchmarks to measure the speed of computers for decades and so we can use the historical results to see just how far computers have come over the last thirty years or so. Back in 1979, for example, the fastest computer on the block according to the N=100 Linpack benchmark was the Cray 1 supercomputer which had a measured speed of 3.4 Mflop/s per processor. More recently, a Java version of the Linpack benchmark was developed and this was used by GreeneComputing to produce an Android version of the benchmark. 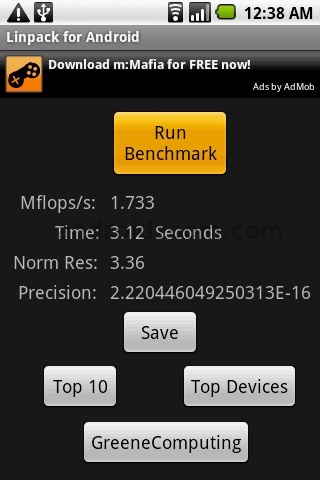 I installed the benchmark onto my trusty T-Mobile G2 (a rebadged HTC Hero, currently running Android 1.5) and on firing it up discovered that it tops out at around 2.3 Mflop/s which makes it around 66% as fast as a single processor on a 1979 Cray 1 supercomputer. OK, so maybe that’s not particularly impressive but the very latest crop of Android phones are a different matter entirely. According to the current Top 10 Android Linpack results, a tweaked Motorola Droid is capable of scoring 52 Mflop/s which is over 15 times faster than the 1979 Cray 1 CPU. Put another way, if you transported that mobile phone back to 1987 then it would be on par with the processors in one of the fastest computers in the world of the time, the ETA 10-E, and they had to be cooled by liquid nitrogen. Like all benchmarks, however, you need to take this one with a pinch of salt. As explained on the Java Linpack page ‘This [the Java version of the] test is more a reflection of the state of the Java systems than of the floating point performance of the underlying processors.’ In other words, the underlying processors of our mobile phones are probably faster than these Java based tests imply. Ensure that they are set to use the same version and you should be good to go.